Mrs. Wilma E. Waite, 98, formerly of Ward St, Salamanca, NY died early Sunday morning, January 15, 2017 at the Bradford Nursing Pavilion following a long illness. Born March 6, 1918 in East Otto, NY, she was the daughter of the late Albert and Freda Schultz Hanson. She graduated at age 16 from Springville-Griffith Institute, Class of 1934. Being too young to enter nursing school, she was employed at the White Star Inn in Chaffee for a year. Then she entered the nursing program at Meyer Memorial Hospital in Buffalo and graduated in 1939. 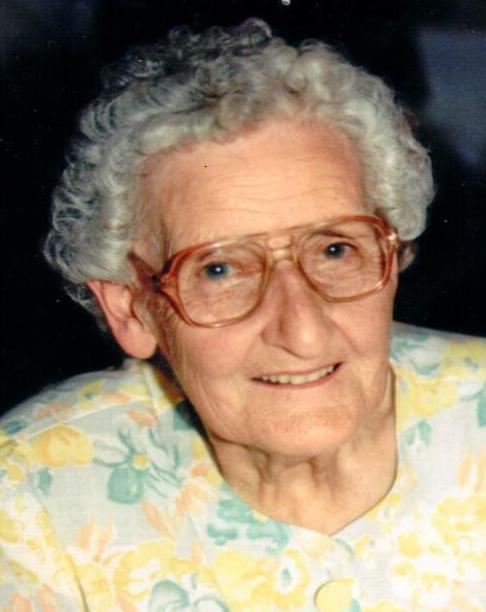 She was a maternity nurse and was employed with the former Salamanca District Hospital for over 46 years and the Tri County Hospital in Gowanda for over 12 years, working in both maternity wards. Her first nursing employment was with the former Tuberculosis Sanatorium in Perrysburg, NY. Mrs. Waite was a long-time member of the former St. Michaels Lutheran Church in Little Valley. She enjoyed gardening, doing puzzles, embroidery, and knitting, and she made several pairs of mittens for her grandchildren. In her later years, she enjoyed bowling in several area leagues and served as the secretary for the Senior Bowling League. She also was awarded Senior Bowler of the Year. Surviving are: 3 daughters, Marcia (Monte) Van Buren, Carol “Sue” (James) Scharf, both of Salamanca, NY, Betsy Waite, Napoli, NY; 20 grandchildren; 41 great-grandchildren; 8 great-great-grandchildren; several nieces and nephews, including a special niece Beverly Bowen, Mansfield, NY; a son-in-law, Gary Wilson, Great Valley, NY; and a daughter-in-law, Louise Waite, Salamanca, NY. She was predeceased by a daughter, Sharon Waite Wilson and a son, Wayne “Sonny” Waite. Friends may call at the O’Rourke & O’Rourke Inc Funeral Home, 25 River St, Salamanca, NY on Wednesday from 4 – 7 p.m.
Funeral services will be held in the funeral home on Thursday at 11 a.m. with Rev. Patrick Cox of the Grace Lutheran Church officiating. In lieu of flowers, the family suggests memorials to the St. Jude’s Children’s Research Hospital, the American Cancer Society, or the donor’s choice.